1,200 volunteers pitch in to pull off our events. You will see them cheering you on at nearly every corner. The historic Fort Wayne neighborhoods you pass through along the course. There’s also a couple that go the extra mile on hospitality (shout out to Williams Woodland, Oakdale and Southwood Park Neighborhoods)! Use it to set a goal. We hear from participants each year about their awesome health journeys and weight loss stories with Fort4Fitness being their literal finish line. We are proud to be a part of these accomplishments! 3-2-BOOM! Our cannon start is no joke. The Old Fort Cannon Crew pulls out all the stops to send off our runners with the firing of a real cannon. And that home plate finish! 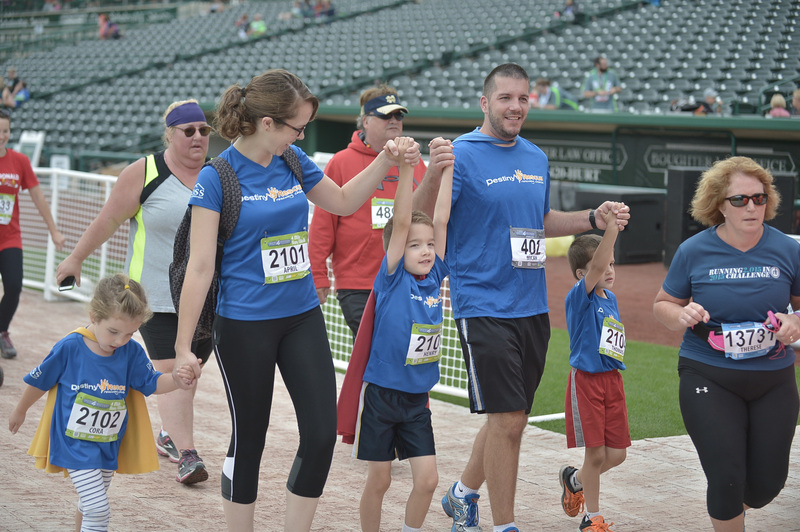 As all races enter the stadium and make their way around the outfield, the jumbo screen captures the runners as they hustle to the finish line at home plate on the TinCaps infield. Put your arms up and smile for the perfect finisher photo! Kids can get in on the fun too. Kids Marathon is a program that runs all summer-long and is only $10! It kicks off in June and continues with activities and group runs every two weeks and culminates with the Final Mile on Friday night at the Fall Festival. Live music, $1 beer or drink and chocolate milk await you following the race. After you’ve put your heart and soul into a good run (perhaps a PR), we know you could use a little entertainment, refreshments and maybe an adult beverage to cool off with. Fort Wayne has the best crowd support! Thousands of spectators, entertainers and community groups line the streets to cheer on participants, provide water at the water stations and decorate neighborhoods to excite and encourage. And we've gotta give props to the Fort Wayne Police Department who we could not pull off our events without! At the finish line, volunteers wait with flashy medals to put around the neck of each race finisher. That’s a lot of finisher medals! Come claim yours after you complete your goal. Fort4Fitness’s Charity Partner Program offers a fundraising platform for local non-profits to connect with runners, walkers and cyclists to spread the word about their cause and raise funds as an official Charity Partner of the race. Participants select the participating charity of their choice during online registration. Fort4Fitness’s Fall Festival began 10 years ago, can you believe it? We are planning some special surprises and will be recognizing those who have participated all 10 years. Stay tuned for the reveal of our anniversary fun. Don’t miss it! Registration opens at midnight on January 1, 2017 at Fort4Fitness.org. Get in on the early bird rate and sign up for the 2017 Spring Cycle or a Fall Festival race. And if you sign up for both Spring and Fall, you’ll get an extra $5 off!